I had 3 chicken tenderloins (when I say tenderloin, I mean chicken pieces the size of a chicken tender). 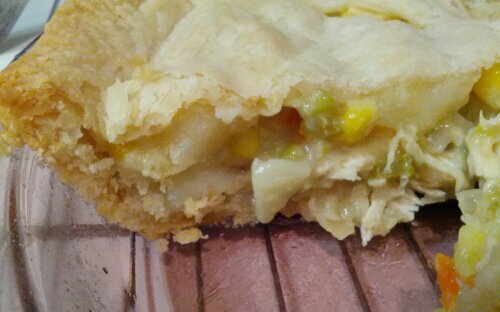 That’s not a lot of chicken but I have found that you can make a chicken pot pie with just a small amount of chicken and it doesn’t seem like it’s just a small amount of chicken. Just load it with veggies! I haven’t written down any recipes online in actual recipe form before so bare with me if this isn’t in the exact right format! Boil water, add chicken tenderloins and poultry seasoning. After the chicken is nearly cooked thru (I always just take a piece and cut it to check), add the potatoes, salt (I just toss some in water – probably about a teaspoon), corn & peas to the chicken water. Continue to boil until the potatoes are just tender. Remove from heat & drain. Rinse with cold water to stop the potatoes from cooking. In a saute pan, melt the butter over medium heat. Add the oil. Add the carrots and celery. When they are almost cooked, add the onions. Cook until onions are tender. Remove from heat. Now take out the chicken tenderloins and cut them into small pieces. Throw everything together in a bowl, add the cream of celery soup. Fold it all together so the soup is evenly mixed. Taste and add salt & pepper as needed. Pour into bottom pie shell. Cover with top pie shell. Crimp together. Cut 5 slits in top to allow steam to escape. Bake in preheated 375° oven for 40-45 minutes (check pie after 30 minutes to see if you need to cover the edges of the pie shell so they don’t over brown). 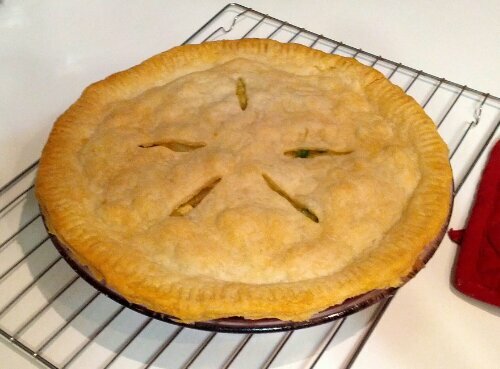 Have a delicious homemade chicken pot pie!